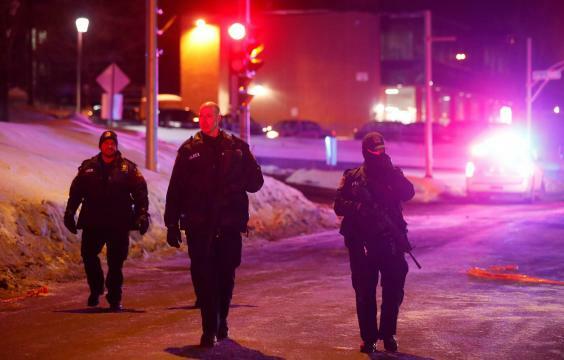 Six people have been killed and eight injured after gunmen opened fire at a mosque in Canada. Police confirmed the fatalities following the incident at the temple in Quebec which has been branded a terrorist attack by Canada’s prime minister. The shooting at the Quebec City Islamic Cultural Centre in the provincial capital happened during evening prayers on Sunday. Christine Coulombe, a spokeswoman for Quebec Police, described some of the wounded as “gravely injured” and added that the dead were aged between 35 and 70. She added that 39 people had been inside the building during the attack. Prime minister Justin Trudeau and Quebec premier Philippe Couillard said the shooting, which happened in the men’s section of the mosque, was a terrorist act. In a statement, Mr Trudeau said: “We condemn this terrorist attack on Muslims in a centre of worship and refuge. “It is heart-wrenching to see such senseless violence. “Diversity is our strength and religious tolerance is a value that we, as Canadians, hold dear. “Muslim-Canadians are an important part of our national fabric, and these senseless acts have no place in our communities, cities and country. Mosque president Mohamed Yangui said the shooting happened in the men’s section of the mosque and he feared some victims were children. “We are sad for the families,” he added. One person was arrested at the scene and another nearby in d’Orleans, police said. The mayor of Gatineau, Quebec, near Canada’s capital of Ottawa, said there would be increased police presence at mosques around his city and in the US, the New York Police Department said it was stepping up patrols at mosques and other places of worship. New York City Mayor Bill Blasio said on Twitter: “NYPD is providing additional protection for mosques in the city. “All New Yorkers should be vigilant. If you see something, say something. “Our prayers tonight are with the people of Quebec City as they deal with a terrible attack on a mosque. In the summer of 2016 a pig’s head was left on the doorstep of the centre. The incident occurred in the middle of Ramadan, when Muslims fast from dawn to sunset – practising Muslims do not eat pork. Francois Deschamps, an organiser of a refugee support group in Quebec City, said the motive was unknown, but right-wing groups were very organised in Quebec City and distribute leaflets at the university and post stickers around town. Mr Deschamps said he has personally received death threats after starting a refugee support group on Facebook and people had posted his address online. “I’m not very surprised about the event,” he said. Canada is generally very welcoming towards immigrants and all religions, but less so in the French-speaking province of Quebec.